Cameron Hill in the days of the incline and pagoda. Click to enlarge. Just to the west of downtown Chattanooga, there looms the remainder of what once was a 370-foot precipice known as Cameron Hill. During the War Between the States, the peak of this hill served as a relay station for signals received from Signal Mountain on Walden’s Ridge directly across from Cameron Hill, where approaching armies coming up the Tennessee River Valley could easily be detected before their entry into the city. With the war over and peace returned, Cameron Hill was envisioned by real estate planners as a beautiful residential area, with the obvious advantage of being so close to the center city yet still removed from all the hustle and bustle of the town below. To this end, the Chattanooga Land Company was formed by a number of stockholders. During, or just prior to the year 1888, the Chattanooga Land Company, for various reasons, decided to disorganize. At the time, it was agreed and so recorded, that three lots on the crown of the hill, would be set aside and donated to any company that would make of them a park, erect hotels and build an incline railway up the side of Cameron Hill from downtown Chattanooga. This it was felt, would greatly improve and enhance the value of all the property around. At the same time, other lots were also set aside for other improvements such as for grading streets. Then an appraisal was made of all the lots and a value was fixed on them and the stockholders were given an opportunity to exchange their stock for lots; the company agreeing in this way to become disbanded. Beginning in early May of 1888, a syndicate of businessmen, headed by A.N. Sloan and Newell Sanders, quietly began the plan to build an incline railway up the side of Cameron Hill, by securing a right-of-way along West 4th Street from Pine Street, two blocks west of Broad Street to the top. By June 9, virtually all the arrangements for the building of the line had been completed and the gentlemen were ready to begin construction at an early date. But then they were met with an insurmountable obstruction. When the Chattanooga Land Company stockholders were given the opportunity of exchanging their stock for lots, there were several small bits of stock left over, of which former company president J.C. Anderson owned one-half of a share and one John R. Dean owned one share and three-quarters. Anderson only asked that he be paid for his one-half share dollar for dollar. As for Dean, although he had the opportunity to place his stock in lots, he declined, saying that there were no lots in which he was interested. Anderson offered Dean any lots he owned on the east side of the hill, but Dean refused the offer. Dean then approached Anderson and proposed that the two “gobble up” the three crown lots, on the claim that the two of them, being the sole owners of the remaining outstanding stock, were now the company and therefore legally owned the lots. To this Anderson declined to accede, stating that under no circumstances would he treat formers friends and business associates in such bad faith. Dean was then offered the par value of his stock in cash so as to settle the affairs of the company, but this offer he also declined. Dean then began a suit against the company, with the claim that he was now the sole residuary legatee of the corporation and was entitled to the three crown lots. This claim was bitterly resisted by the rest of the company incorporators. In the meantime, Messrs. Sloan and Sanders, who desirous of building their incline, offered a large advance for Dean’s stock well over the purchase price he had paid for the property, amounting to about $40. Dean declined the offer, demanding instead $7,500 for the stock in question. Under no circumstances could Dean be swayed from that amount and thus, on June 9, Mr. Sloan announced that if the incline could not be built unless Dean were paid the exorbitant tribute money, someone else would have to build it. Although on June 15 Sloan announced that the incline plans had not been totally abandoned and indeed surveys for the line were underway at the end of the month, on July 14, Messrs. Sloan and Sanders announced officially, that they had abandoned the project. Realizing that a lawsuit between Dean and the other property holders could be of no substantial benefit to anyone, a compromise was thereafter worked out by both factions. In late August 1888, announcement was made that John Dean would be allowed to have the crown lots in question and the company would relinquish its claim to them, with the understanding that Dean would organize a company which would put the planned $25,000 improvements on Cameron Hill, to include the building of the proposed incline railway on the eastern slope of the precipice. Dean accepted the challenge! In mid-September 1888, it was reported that Dean had traveled to Pittsburgh, where he had succeeded in securing financial backing for the undertaking. The financial assistance had been had on condition that the Pennsylvania backers could secure certain unlisted privileges from the company. Apparently this move failed and Dean abandoned his involvement with these promoters. Undaunted by this initial failure, plans were drawn up for the building of the proposed operation whenever monies for the undertaking could be secured. Again, thereafter, Dean interested one Roland C. Cook in the undertaking. Cook was a local Chattanooga businessman who had been most successful in the creation of the Tennessee Transportation Company operating steamboats up and down the Tennessee River. For his efforts in the Cameron Hill venture, Mr. Cook was offered an amount of stock in the organization should he be successful in amassing the necessary capital. On December 15, 1888, a state charter was granted for a company that would have the longest official title in Chattanooga’s street railway history and one of the shortest tenures of existence! Dean’s company was given the title of the Cameron Hill Incline, Hotel, Private Park & Street Railway Company. Per its name, in addition to the incline railway, the company envisioned a hotel on Cameron Hill’s crown, a city park and a street railway as well, to operate from Chattanooga’s downtown and also its eastern suburbs, to connect with the incline itself. On the night of December 18, 1888, an ordinance was granted on first reading by the City of Chattanooga for the new undertaking. This was followed on January 3, 1889, by the Mayor and Board of Aldermen giving their full blessings to the new proposal by passing the ordinance on second and final reading. The details of the granted right-of-way were published in the local newspaper. From the granted franchise, it is noted that the incline right-of-way was to be operated in the middle of the street along West 4th Street, from its beginning at Pine Street, westward over Poplar and Cedar Streets, where it would begin its ascent over private right-of-way to the top of Cameron Hill at Cameron Street. It was to cross streets at grade at Pleasant Street, Prospect Street, Anderson Street and Cameron Street to the station to be built on top. Of interest were the plans that called for the incline’s cables to be placed underground the distance from Pine to Cedar Streets, reputedly making this the only such underground cable line south of the Ohio River. The additional trackage asked for on the hill along Cameron Street west to Arcade, to Prospect, along West 6th to Broad and over Broad south to 7th and north to 4th and return over 4th to Pine, were for the proposed street railway operation. The route east along 4th to Moon, north to Harrison (East 3rd Street today), to East End Avenue (Central Avenue today), was also planned as a street railway venture. It was estimated by the local management, that the cost of construction would not exceed $10,000. Coffin & Stanton were to supply these monies. An additional $50,000 was to be secured in cash by putting a mortgage on the plant, in addition to which, $60,000 in capital stock was to be issued, bringing the total venue to $120,000. Dean and Cook were to have an option on that stock, with the right to purchase the same within a limited time at twenty-five cents on the dollar. On April 2, 1889, the City of Chattanooga amended its original January 3 ordinance with the company, by granting the firm an additional right-of-way for its street railway line. With the new ordinance in hand, the company could build its street railway from the Tennessee River at 1st Street along Pine Street the distance to 8th Street. With financial matters virtually taken care of thanks to Coffin & Stanton, on April 23, 1889, the company secured yet another valuable franchise. It was given the right to lay water mains and pipes on the streets of Cameron Hill to make the property even more enticing for prospective purchasers. With all the negotiations perfected and with the money provided by Coffin & Stanton, in late May 1889, the local engineering firm of Guild & White was given the contract to undertake the primary aspect of the project…the building of the Cameron Hill Incline and the construction of the street railway. On June 5 they reported that at that time they were receiving bids on the incline’s construction and actual work could begin “in ten days.” Rails for the street railway to be built along 4th Street from Pine Street at the incline’s foot had already been purchased and negotiations for the incline machinery were then pending. On that same June 5 date, the company had two architects on the hill planning the building of the park and a proposed pagoda or hotel and casino. On June 12, 1889, the company purchased Lot 121 in the Cameron Hill Addition, 400-feet south of the flagpole then situated at the crown of Cameron Hill, for the site of the incline’s top station. At the same time, the firm purchased Lot 3 in the Boyce Addition lying just to the west of 4th and Cedar Streets as the site for the location of a large steam pump. This pump was to be located there to force water up the hill from the main water line of the City Water Company into a standpipe on top of the hill to be 60-feet in height. Because the Ridgedale reservoir then supplying the city’s water was only 200 feet in height and Cameron Hill’s height was 370 feet, water could not be had from the existing source. A 25-year contract by that date had already been negotiated with the City Water Company to implement this improvement. By June 20, 1889, actual construction was underway. On that date a contract was awarded to George L. Gillespie of Chattanooga for the building of the railway. The June 20 Evening News explained the events of the day and the June 20 Sunday Times wrote in even more detail the awarding of the contracts. As noted in the original franchise granted the company for the building of its street railway, work had to begin within six months of the bill’s passage, which had taken place on January 3, 1889. With the six months nearing their end the firm had still not begun the undertaking of the proposed car line along Pine Street. To rectify this, at about 11:00 p.m. the Tuesday night of July 1, 1889, John Dean himself and a group of laborers proceeded with dim lamps, picks and shovels, to the intersection of 6th and Pine Streets and began to lay track along 6th Street eastward towards Market Street. Mayor Nicklin and Alderman Dyer happened to chance by about 11:30 after having attended a late city alderman meeting and they noted the activity. As was the custom of city governments in so many cities at that time, besides granting a right-of-way to the Cameron Hill people for a car line at 6th and Pine, on the same January 3, 1889 date, a similar franchise had been granted the long-entrenched Chattanooga Electric Street Railroad Company. Ordering the Cameron Hill workers to cease their construction, saying that the Chattanooga Electric Street Railroad had the right-of-way preference, the mayor immediately called for police when the laborers refused to heed his command. Local police arrested the men and stopped them from laying additional rails. Only two rails had been laid at that time. At around 1:00 in the morning, John Dean secured the services of Chancellor Dewitt, who issued an immediate injunction against the mayor and aldermen from interfering with the work of the Cameron Hill company. Meanwhile, in the early morning, police arrived on the scene and removed the two rails in question by orders of City Hall and a lively fight was underway! At 10:50 the following morning, Wednesday, July 2, the Mayor and Aldermen filed their own injunction against the Cameron Hill line in chancery court. At about the same time, attorney Otto Fisher was employed by a number of Cameron Hill resident along 6th Street, to swear out warrants for the arrest of John R. Dean, Colonel Tabler, Mr. White of Guild & White, Will Gaston, James Gilland and nineteen Black laborers who had been employed in the laying of the street railway tracks. At 4:00 p.m. that same July 2 date, the Chattanooga Electric Railroad Company secured its own injunction against the Cameron Hill line, alleging that on January 3, 1889, their company had first secured a right-of-way over West 6th Street for a car line up Cameron Hill. Specifically, the Electric Street Railway Company had been granted the right to build a car line from 6th and Broad Streets, west over 6th to the side of Cameron Hill on Cross Street, and to build from 6th and Prospect Streets, north over Prospect the distance to its end at the point of Cameron Hill. At that very time, continued the injunction, the Chattanooga Electric Railroad had gone to considerable expense by making surveys and locating its route with a view towards building on Cameron Hill. In addition, the injunction alleged, that after the above right-of-way had been granted their company, the Cameron Hill people applied to the city fathers for a similar right-of-way over West 6th and secured such a right-of-way-subordinate, however, to the right of the Chattanooga Electric Street Railroad. The Electric Street Railroad then additionally alleged, that before the final ordinance granting their company their franchise had been entered into the official ordinance record book, it was obtained by someone “working in the interest of the Cameron Hill people” and when it was returned to the auditor, it was found altered and changed so as to erase out all that section which subordinated the right-of-way of the defendant Cameron Hill line to the Electric Street Railroad concern. These erasures were fraudulently made, continued the injunction, but the auditor discovered the fraud and restored them as when originally passed and approved by the Board of Aldermen. 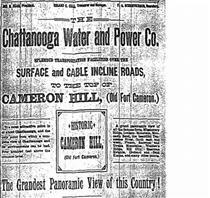 The injunction continued to allege, that after the passage of this ordinance on January 3, 1889, the company “by some curious proceeding,” undertook to amend its charter and to change the purpose of its original organization so as to convert the company into the Chattanooga Water & Power Company. The complainant Chattanooga Electric Street Railroad Company alleged that this move was void and unwarranted. In answer to all the injunctions, when interviewed that same July 3 day, John Dean allowed, that his company, as early as December 18, 1888, had first made application for the use of West 6th Street for their street railway line. As for the supposed erasure on the ordinance referred to in the injunction, it was made by City Auditor Whiteside himself at the suggestion of several aldermen who maintained that the right-of-way granted the Cameron Hill company had not been made secondary to that of the Chattanooga electric Street Railroad Company. On Friday, July 4, the Cameron Hill faction quietly suffered the injunctions heaped upon them and made no attempt to continue to build a line of track on the disputed West 6th Street right-of-way. Instead, they pushed their work on Pine Street from West 4th almost to 8th, preparing that street for the crossties and the rails which were to be put down as soon as possible. At that time, Cameron Hill attorney, Judge J. A. Warder, was reported busy preparing an answer to the many injunctions. Again the Times for the date July 5 explained the day’s events in detail in an article that proclaimed that the incline would be operating by August 15. On July 6, the Cameron Hill people had a crew of men prepare a line of track to be laid on West 4th Street west of Market to Pine, over a right-of-way undisputed by any other company. Because the ordinance granting the Cameron Hill operation also allowed the Cameron Hill company to build east of Market along East 4th Street, to Moon, to Harrison (East 3rd Street today) and on to East End Avenue (Central Avenue today), streets over which the existing City Street Railroad Company claimed to have secured a right-of-way from the city back in 1872, from the original charter granted the never-built Chattanooga & Lookout Street Railway Company and on that July 6 date, the City Street Railroad enjoined the Cameron Hill line from attempting to lay any track on 4th Street east of Market Street, as they assumed the Cameron Hill people were attempting. Relative calm returned to Chattanooga for the next several weeks. On July 8, work was continued by Cameron Hill railway forces on the Pine Street car line, and laborers began the task of preparing the streets for its new incline railway. In the meantime, rails were being laid rapidly on West 4th Street from Market to Pine for the proposed Cameron Hill horse drawn railway. In mid-July, word was received that the New York investors, Coffin & Stanton, were very much displeased by the treatment then being afforded the company by the City of Chattanooga. Despite the many problems, however, work continued and progress began to be made on the Cameron Hill project. Cameron Hill company attorney J.A. Warder had prepared his answer for chancery court Judge Dewitt and on July 19, he was to have presented his position in his attempt to dissolve the injunctions against his organization. On that date, however, the City Street Railroad Company filed an amended bill in answer to the Cameron Hill injunction and that action postponed the motion of Attorney Warder to dissolve the original injunction. The amended bill by the City Street Railroad raised the question of the legality of the one Cameron Hill charter, which embraced several different departments of business. In the one Cameron Hill charter, the company had become a hotel, a park, a water and a railroad company! Still, work somehow managed to continue on the line and it was detailed in the July 21 Times. Another Injunction! This One Against the Incline! Even as Attorney Warder was attempting to answer one injunction, one John W. Watt, a resident of Cameron Hill that very July 24, 1889 date obtained a temporary injunction against the Cameron Hill company from building the incline up West 4th Street. In this bill, Watt asked that the company be restrained “from moving or interfering with the lateral support along the side of his lot on the side of Cameron Hill, or from excavating or trestling in any manner” so as to change the existing strains on his lot or the streets adjoining it, “so as to interfere” with his use of same. Remarking that the new injunction might delay his line but not stop it, undaunted John Dean, on July 27, filed a demurrer and answer to Watt’s injunction, saying that the building of the incline railway would only improve the value of his property. Still the external problems were not fully holding up progress on the undertaking. On July 31, 1889, the Times explained exactly how the planned pagoda on the hill would be built. Verandas would afford a wonderful view of the city. The lower floor would have a billiard room, café, and office. The second floor would host a dance floor. Some good news transpired for the company on the date of August 5, 1889. At that time, the injunction against the building of the incline by John W. Watts was dissolved and the company was free once again to build up the side of the hill. By that date, lumber had already been delivered and positioned on the ground for the water pumping station to be erected at West 4th and Cedar Streets. Work was then undertaken with all possible dispatch, in what it would turn out, would be an unsuccessful attempt to have everything in readiness by the time of the meeting of the Grand Army of the Cumberland scheduled to take place September 20 of that year. 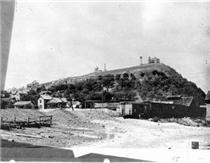 On August 18, a large force of men was busy grading the incline right-of-way up the steep hill. By that date, West 4th Street had been filled and graded from Poplar Street west and crossties and rails had been distributed for the incline railway. On the following day, the work force was somewhat increased in an attempt to complete the line in four week’s time. The standpipe and machinery for the waterworks was then also being delivered and the foundation for that had about been completed. This phase of construction was due to commence immediately as well. On that same August 19 day, three horse cars to be used on the street railway are reported to have arrived from a Philadelphia firm, although this disputes other information about the cars mentioned in the July 21, 1889 Chattanooga Times, that the equipment had been ordered from A.T. Wilson & Company of Pittsburgh. (It is quite possible that A.T. Wilson Company might have been a Pittsburgh firm dealing in the sale of second-hand cars that might have indeed operated in Philadelphia). Temporarily they were allowed to be stored in the City Street Railroad’s White and Whiteside Street (Broad and 25th Street today) car barn. They were described as being about the size of the City Street Railroad’s Vine Street horse cars then in operation, although slightly lighter. As for the two incline cars, they were then also under construction at the local shops of the Chattanooga Car & Foundry Company. By August 22, the interior woodwork had been completed and the cars were expected to be turned out in two week’s time. By August 28, the retaining wall along the incline right-of-way had been completed and the contract for the building of the pagoda, still not undertaken, was expected to be let shortly thereafter. On Wednesday, August 28, 1889, the City Street Railroad Company began to lay rail on Harrison Avenue (East 3rd) in anticipation of locating the proposed horse car right-of-way from East End Avenue (Central) the distance westward to Market Street downtown. The Cameron Hill incline management was not about to allow this to happen without a fight and treasurer and manager, Roland C. Cook, sought to enjoin the company from so doing. To his chagrin, he found Chancellor Key, Special Chancellor Dewitt, Special Judge Moon and Judge Trewhitt all out of town. Not to be undermined, Cook took the late night train to nearby Cleveland, Tennessee, where he had Judge Traynor awakened at 2:00 in the morning, from whom he secured a fiat to his injunction. Cook then returned to Chattanooga on the next morning’s early train and had the City Street Railroad served with the legal papers. Oddly enough, although completion of the incline and its opening date for actual operation was still several months away, an advertisement appeared in the September 1, 1889 Chattanooga times, making it seem as though the line were already fully completed. On Monday, September 2, the boiler that was to provide the steam with which to power the incline machinery had arrived and work was then underway laying the stringers for the railway right-of-way. Effective September 4, 1889, the City of Chattanooga granted additional rights to the Cameron Hill line. Specifically they were allowed to extend their street railway one more block southward along Pine Street from West 8th to West 9th and were also permitted to erect poles for their signaling system of the incline cars. On the morning of September 9, 1889, Superintendent Wayland of the Bryant Transfer Company, who had the contract to deliver the boiler in good condition, placed the machinery on its foundation without incident or problem. On Friday, September 13, all the stringers were positioned and the rails began to be laid for the incline. The incline cable began to be strung the next day. With the engine and boiler already in place in the station atop Cameron Hill, and with electric lights up as well, the incline’s first trial trip was scheduled for the following Monday, September 16, 1889. That date, however, had to be postponed until Friday, September 20, but the trial run took place at that time as recorded in the September 21 Chattanooga Times. Even as the incline was making its maiden trial run, signally the completion of that phase of the operation, which had surmounted so many obstacles to accomplish, that very September 20, 1889 day, a serious internal problem became public. John R. Dean, the company’s president, brought suit in chancery court against Ronald C. Cook, the treasurer and manager and against Coffin & Stanton, the bankers who had provided the finances for the Cameron Hill development. The intricate and complex problem was explained in the September 21 Chattanooga Times and the Evening News. Despite the rumor that work would once again cease, that turned out to not be fact and on September 22, labor on the beleaguered line was underway once more. On Thursday, October 10, 1889, another trial trip was made on the incline railway, but as the descending car was built to go down on its own gravity and the grooved pulleys that bore the cable would not turn on account of not having been oiled, the car going down would not move at many points without some assistance. Additionally on that October 10 day, the horse car line was also tried out from West 4th to West 9th Street on the Pine Street route. On October 19, the Dean vs. Cook and Coffin & Stanton injunction was answered by the defendants and explained in the pages of the next day’s Chattanooga Times. By the same October 19 date, the Cameron Hill waterworks had been completed and the standpipe had been filled and was then ready to supply the important element to the residents of Cameron Hill. The necessary retaining walls were then going up at the Cedar Street crossing between Cedar and Prospect Streets and work on the pagoda on the hill’s crest was said to be progressing. By October 26, the wall was virtually completed. Because the company was still experiencing problems with the incline cables, a last-minute change in the plans brought about a final solution to the problem. This important feature in the incline’s operation was detailed in the October 30, 1889 Chattanooga News. An historic date in Chattanooga transit history was recorded on Thursday, November 14, 1889, when the Chattanooga Water & Power Company’s horse car line from the Tennessee River at West 1st Street to West 9th was opened for the first time officially. As for the incline, it was still having cable difficulties and could not be opened at that time. Trials over the incline continued the following day, Friday, November 15. At long last, on Saturday, November 16, 1889, regular service over Chattanooga’s newest incline (the Lookout Mountain incline #1 was already in operation) was thrown open to the public. The November 21 Evening News had an interesting and descriptive article about the company and the work then continuing on the pagoda. On the second Sunday after the incline had officially been opened for business, on November 24, it is reputedly that fully 1,000 people rode on Chattanooga’s newest attraction and the line by then, it was reported, was operating smoothly and without incident. The Cameron Hill Incline was often reported in the local newspapers, with a mix of good and bad news; mostly bad. Click to enlarge.